Want such a mesh, without hand techniques or extra steps. In both slip and tuck every space that has a hole, black square, etc. that brings a needle out to to D position (for some unfathomable reason Brother needle positions go A,B,D,E, poor C got skipped) will actually knit. In slip the non selected needles gets skipped, in tuck the non selected needles will hold a loop until that needle is returned to D position. Side by side loops are troublesome in any stitch type. That aside, tuck can be employed to sequentially lay down loops in some patterns where the lace carriage ultimately moves to produce side by side empty needles. The usual caution with such fabrics: extension rails must be used. 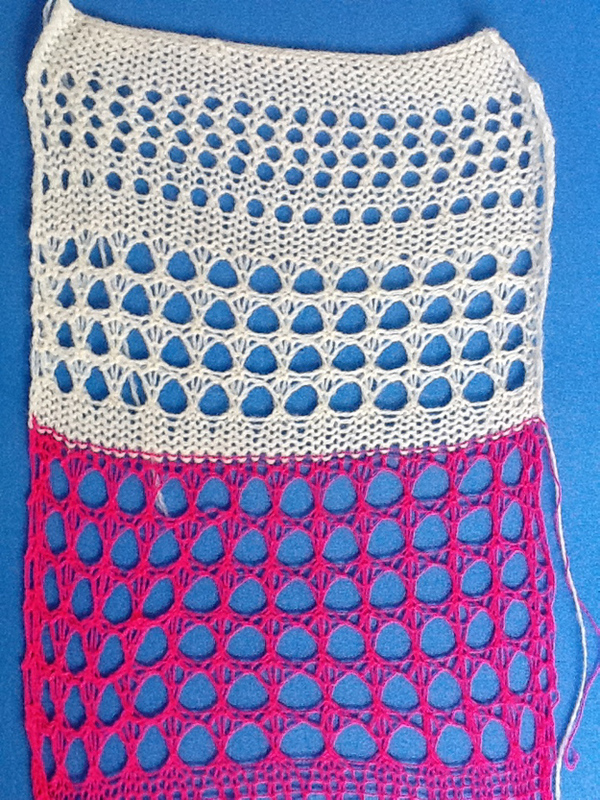 Yarn needs to be “friendly” enough to not break easily, and since stitches travel across a wider gap than in single eyelet lace, tension needs to be looser as well. Small changes can make a big difference, and so can patience. I am saving the failed attempts for future felting experiments. In the fabric below the lace carriage is set for normal lace, the KH carriage to select pattern (KC) and both tuck buttons are depressed. 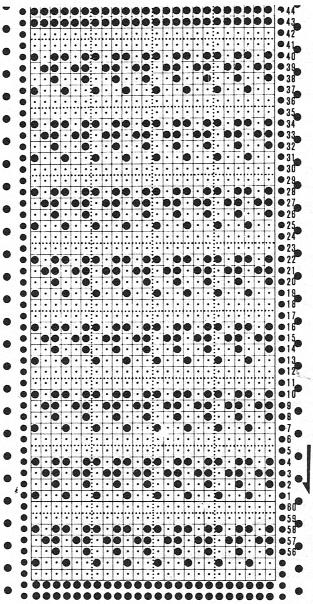 Each carriage works in sequences of 4 rows throughout. For me this experiment will probably fall in the “now that I’ve done it, broken several rules and have one good result I am over it” category. 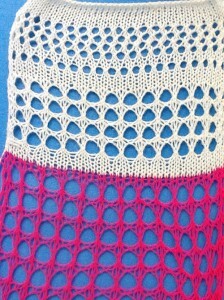 Some observations: top bind off as seen in the swatch below, was tight for the fabric. To maximize width, bind off should be around at least 2 gate pegs, even 3 if needed. This allows for completing the task on the machine without adding more work and incorporating hand techniques. Same is worth considering in tuck fabric: the nature of tuck is to be short and fat, lace wants to open up, so this fabric definitely will want to spread. 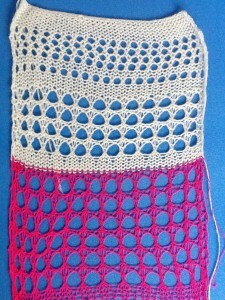 The top approximate 1/3 of the swatch images show use of the same white yarn, knit in standard single needle mesh. The size difference in “holes” created with the tuck method is easily seen. The white is a 2/8 wool, the other a 16/2 mystery fiber I usually use as waste yarn. 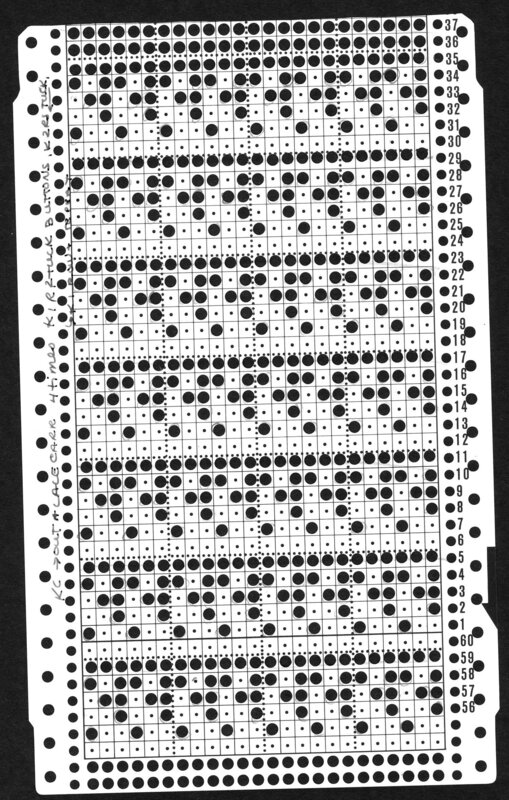 The punchcard itself follows as well. 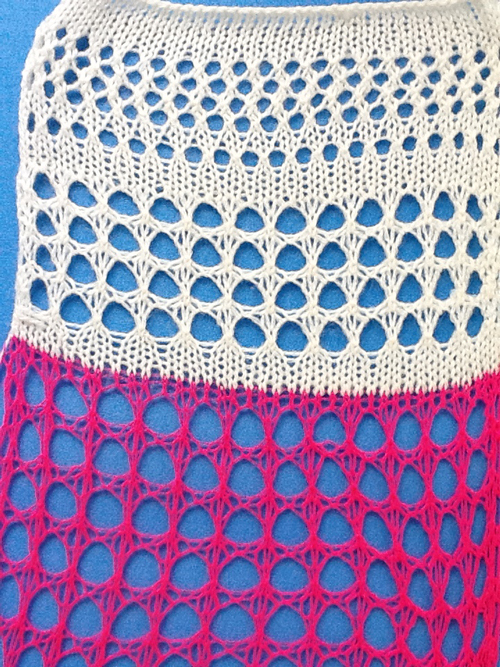 Next on the to do list: “filet crochet” simulations in machine knitting. 3/19/18: While recently reviewing and recycling some ancient MK pubs I came across the card as published below. Directions required releasing the cam buttons for a single row to complete an all knit one after each of the tuck stitch sequences, then resetting cam buttons for tuck. Adding an all punched row in card above, eliminates that step, making the process far quicker and less error prone. Tuck works like slip stitch in terms of free passes and knitting: with both tuck buttons pushed in and all needles in B it allows for free pass. 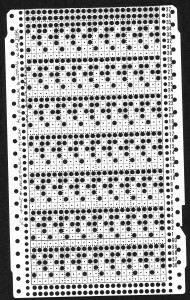 With needles selected, the preselected needles (punched holes) will knit, while the non selected needles hold loops until they are selected by a punched hole again.